Welcome to the Jeffrey Family Home Pages. We welcome any and all visitors, and especially those of Jeffrey origin. These pages are the meeting place for the generations of Jeffrey and their families. Beautiful Wales, mountainous land of the red dragon and Eisteddfods (music festivals) and King Arthur gives us the distinguished surname of Jeffrey. The Romans vacated the British Isles at the end of the fourth century. The Welsh or Ancient Britons were left in sole possession of all England, all the way to the north banks of the Clyde. The Saxons forced them westward into the mountains of what is now Wales, north to Cumberland and southern Scotland, and into Cornwall. Rhodri Mawr, or Rodrick the Great was the first recorded monarch of all Wales, he died in 893. On his death, he gave Wales to his three sons, Anarawd became king of North Wales, Cadalh became king of South Wales and Mervyn became King of Powys, or mid-Wales. The history of the name Jeffrey also emerges from these same welsh chronicles. It was first found in Herefordshire where they were seated from very ancient times, some say well before the Norman Conquest and the arrival of Duke William at Hastings in 1066 AD. From some of the many early records researchers examined, manuscripts such as the Doomsday Book, the Pipe Rolls, the Black Book of the Exchequer, the Curia Regis Rolls, our family name, Jeffrey was traced in many different forms. Although our name was mentioned in the different records, it was spelled Jeffreys, Jeffereys, Jeffries, Jeffers, Jefferis, Jefferyes, Jefferys, Jeffry, jeffs, Jefries, Jefery. These changes in spelling frequently occurred, even between father and son. It was not uncommon for a person to be born with one spelling, marry with another, and still have another on the headstone of his or her final resting place. The Norman conquest of Wales was less than conclusive. A testimony to the Welsh fighting spirit is that there are more castles, or ruins of castles, to the square mile in Wales than anywhere else in the world. The Welsh tactic was to thrust, then to retire to their bleak mountain homes to plan their next attack. As peace gradually returned to this picturesque country, the Welsh, attracted by the economic opportunities moved eastward into the English cities. 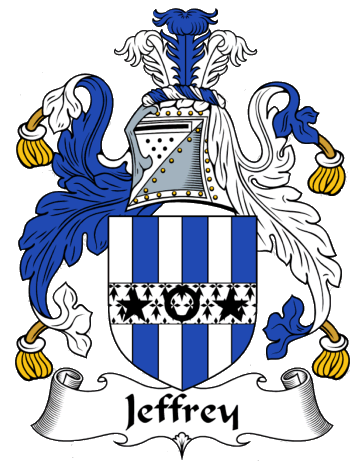 The distinguished Welsh family name of Jeffrey emerged in Herefordshire where they were recorded as a family of great antiquity seated with manor and estates in that shire. The distinguished family name has claimed direct descendancy from the great Tudor Trevor, Lord of Hereford, Whittington, and founder of the Welsh Tribe of Marches, son of Ynyr Ap Cadforch, Lord of Powys, and Llodoca Ap Caradoc Vreichfras, Lord of Hereford. They branched into neighboring Worcestershire at Earls Crom granted to them by King Edward VI and also established estates at Clifton, Corncastle in that same shire. They also acquired the estates of Slywell and Priory in Breconshire, and also at Acton in Denbighland. The notorious Lord Jeffreys, the hanging Judge, was descended from the branch at Wem. For the next two or three centuries,the surname Jeffrey flourished and played an important role in local country politics in the affairs in Britain in general. Religious conflicts followed. The newly found fervor of Cornwellianism found the Roman Catholic Church still fighting to regain it's status and rights. The power of the church and the Crown, their assessments, tithes, and demands imposed a heavy burden on rich and poor alike. They looked to the New World for their salvation. Many became pirates who roamed the islands who roamed the West Indies. Some were shipped to Ireland where thay were known as adventures of the land. Essentially, they contracted to keep the Protestant faith, being granted lands for small sums, previously owned by the Catholic Irish. In Ireland they settled in county Cork where they took over Blarney Castle. Records show the family settled there from the second half of the 17th century, particularly the spelling Jeffers and Jeffares. Some moved to Carlow and Dublin, and today the name is popular in Belfast. The New World held many attractions. Many Jeffreys sailed across the stormy Atlantic aboard the tiny sailing ships built for 100 passengers, but sometimes carrying 400 - 500. These ships were to become known as the "White Sails". The overcrowded ships, sometimes spending as much as two months at sea, were wracked with disease. Those that survived the elements were often stricken with small pox, dysentery, and typhoid, sometimes landing with only 60% of the original passenger list. Robert Eden settled in the Grand Lake area of Queens County, New Brunswick, Canada. Little is known of Euphemia, but it is believed she died while in barracks in Halifax. Queen Victoria was anxious to have the boundary lines between Canada and the United States settled. The Queen came to the barracks in Ireland to pick out and detail men of the regiment to come to Canada. Peter Andrew was one of the men chosen. Peter Andrew was 6'4", weighed in excess of 200 lbs, fair skin and red hair. This move was in 1842 and the time of the Ashburton Treaty. Peter Andrew was first sent to Halifax, then Saint John and then Fredericton. During this time Elleen moved first to the barracks in Halifax, and twins James and Mary were born and then the family moved to the barracks in Saint John. After nineteen years of army service he retired and shortly after Elleen died and is buried in the Old Burial Ground in Saint John, New Brunswick, Canada. Peter Andrew took up the shoe making trade and with the twins, he moved to Connecticut, USA, worked in a ship yard, and married Mary McCarty. Very shortly Mary died. There were no children from this marriage. he rejoined the army for a few years and then returned to New Brunswick and settled in the Grand Lake area. Queen Victoria granted land in the Jeffrey name from Grand Lake to Washademoak Lake in Queens County, New Brunswick, and the Jeffrey family have built their homes and settled there. Peter Andrew finally came back and lived with his son J. William at Bagdad, New Brunswick. he died at the age of 86 and is buried at Saint Lukes cemetary, Youngs Cove Road, New Brunswick. The spelling Jeffery and Jeffrey does not seem to have any distinction. Even within families, the spelling varies without reason.